This custom breakout board lets you easily access all 40 of your Raspberry Pi's GPIO pins on a breadboard. It's the perfect companion for adding circuits and experimenting with the Pi. Of course, this isn't an "ordinary" GPIO breakout for the Pi. It's pre-soldered and custom designed with 3.3V and 5V power supply pins that fit perfectly into standard-size (full and half) breadboard power rails to simplify wiring. This way you can focus more on your project and less on which jumper wire goes where. Other details include an optimized PCB layout for better access to your breadboard, clearly labeled pins, and a keyed header shroud to ensure proper connection. 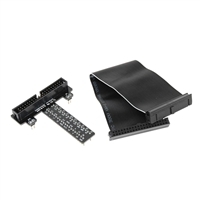 A 6" 40pin terminated ribbon cable is also included so you can get started right away.